The grand chancellor, also translated as counselor-in-chief, chancellor, chief councillor, chief minister, imperial chancellor, lieutenant chancellor and prime minister, was the highest-ranking executive official in the imperial Chinese government. The term was known by many different names throughout Chinese history, and the exact extent of the powers associated with the position fluctuated greatly, even during a particular dynasty. In the Spring and Autumn period, Guan Zhong was the first chancellor in China, who became chancellor under the state of Qi in 685 BC. In Qin, during the Warring States period, the chancellor was officially established as "the head of all civil service officials." There were sometimes two chancellors, differentiated as being "of the left" (senior) and "of the right" (junior). After emperor Qin Shi Huang ended the Warring States period by establishing the Qin dynasty (221–206 BC), the chancellor, together with the imperial secretary, and the grand commandant, were the most important officials in the imperial government, generally referred as the Three Lords. In 1 BC, during the Emperor Ai, the title was changed to da si tu (大司徒). In the Eastern Han dynasty, the chancellor post was replaced by the Three Excellencies: Grand Commandant (太尉), Minister over the Masses (司徒) and Minister of Works (司空). In 190, Dong Zhuo claimed the title "Chancellor of State" (相國) under the powerless Emperor Xian of Han, placing himself above the Three Excellencies. After Dong Zhuo's death in 192, the post was vacant until Cao Cao restored the position as "imperial chancellor" (丞相) and abolished the Three Excellencies in 208. From then until March 15, 220, the power of chancellor was greater than that of the emperor. Later this often happened when a dynasty became weak, usually some decades before the fall of a dynasty. During the Sui dynasty, the executive officials of the three highest departments of the empire were called "chancellors" (真宰相) together. In the Tang dynasty, the government was divided into three departments: the Department of State Affairs (尚書省), the Secretariat (中書省), and the Chancellery (門下省). The head of each department was generally referred to as the chancellor. 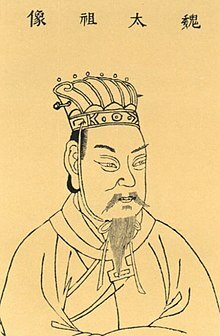 In the Song dynasty, the post of chancellor was also known as the "Tongpingzhangshi" (同平章事), in accordance with late-Tang terminology, while the vice-chancellor was known as the jijunsi. Some years later, the post of chancellor was changed to "prime minister" (首相 shou xiang) and the post of vice-chancellor was changed to "second minister" (次相 ci xiang). In the late Southern Song dynasty, the system changed back to the Tang naming conventions. During the Mongol-founded Yuan dynasty, the chancellor was not the head of the Secretariat, but the Crown Prince (皇太子) was. After the establishment of the Ming dynasty, the post became the head of the Zhongshu Sheng again. The post was abolished after the execution of Hu Weiyong, who was accused of treason (though his conviction is still strongly disputed in present times because of a lack of evidence to prove his guilt). Still, appointments of the people who held the highest post in the government were called "appointment of prime minister" (拜相) until 1644. Cao Cao, who controlled the Late Han dynasty, one of the most famous Chinese chancellors. Shi Miyuan/Shih Mi-yüan (1207–1233 in office). The Qing dynasty bureaucratic hierarchy did not contain a chancellor position. Instead, the duties normally assumed by a chancellor were entrusted to a series of formal and informal institutions, the most prominent of which was the Grand Council. Occasionally, however, one minister may have so dominated the government that he comes to be identified, figuratively, as the "chancellor". One example in the late Qing dynasty was Li Hongzhang. In 1911, the Qing court adopted reforms which, amongst other changes, established the position of Premier. This position existed for less than a year before the Qing government was overthrown. ^ (in Chinese) Guan Zhong Memorial Opened in Linzi, Xinhuanet, September 19, 2004. ^ Royal Asiatic Society of Great Britain and Ireland. North-China Branch (1876). Journal of the North-China Branch of the Royal Asiatic Society, Volume 10. SHANGHAI: The Branch. p. 85. Retrieved June 28, 2011. ^ (in Chinese) Chancellor of China, Sina.com. ^ Book of the Later Han Vol.72; Records of Three Kingdoms Vol. 6. ^ Records of Three Kingdoms Vol. 1. ^ (in Chinese) The History of the Chancellor System in China. ^ (in Chinese) Tong Zhongshu Menxia Pingzhangshi, Encyclopedia of China. ^ (in Chinese) "Chancellor in the Song Dynasty"
^ (in Chinese) The Change of Central Administration in Tang and Song Dynasties. ^ (in Chinese) The History of Chancellor of China, QQ.com. This article incorporates text from Journal of the North-China Branch of the Royal Asiatic Society, Volume 10, by Royal Asiatic Society of Great Britain and Ireland. North-China Branch, a publication from 1876 now in the public domain in the United States. Li, Konghuai (2007). History of Administrative Systems in Ancient China (in Chinese). Joint Publishing (H.K.) Co., Ltd. ISBN 978-962-04-2654-4. Wang, Yü-Ch'üan (June 1949). "An Outline of The Central Government of The Former Han Dynasty". Harvard Journal of Asiatic Studies. 12 (1/2): 134–187. doi:10.2307/2718206.